Xin Yi is a Chinese internal martial art, part of the branch of Xing Yi. The full name is Xin Yi Liu He Quan and is also known as Henan Xin Yi Quan. It is one of the three major branches of Xing Yi. Xin Yi is a powerful self-defense method that, like the other internal martial arts, also supplies health, fitness, emotional stability and mental strength. It is a fun way to improve your life, and perhaps save it one day. Xin Yi is an excellent way to first learn and practice the profound principles of internal martial arts. It is a clear pathway for those transitioning from harder style martial arts or beginning martial arts for the first time. It is something a dedicated newcomer can pick up. Bob Lau’s Xin Yi seems to especially appeal to martial artists over the age of 40 or 50 who want to deepen their knowledge and skills while improving their health. When you first find Xin Yi you may not realize its value. Xin Yi is a gem, hidden and covered. It may seem like just another rock in the ocean of physical arts, one more exercise possibility out of thousands, one more martial art out of hundreds. When you begin to clean that rock and bring it into to the light for a closer look, you begin to perceive its sheen and sparkle. Sticking with Xin Yi for a while, you are surprised at how much you learn that you had no idea about and how good practicing it makes you feel. You start to notice the intricate veins of organized color within it, cueing you to deep, barely seen patterns of beauty. You realize there is more inside than out. Playing with it more, you gradually realize just what a surprising treasure you have discovered, a golden bounty, an organized collection of practices that leads you to discover the greatest treasure: Vital health. Xin Yi doesn’t have the overt beauty of a Taiji, or a Bagua, but boy does it feel good to do. There are no high kicks in Xin Yi. Xin Yi is performed on a line, with forward movements and 180 degree turning moves to begin the next line. Xin Yi has unique stepping methods that train distancing, power production, self protection, and cardiac health. Xin Yi looks like an external martial art, with its explosive direct movements, but it is completely founded on the principles of the internal martial arts. It builds endurance by relaxing the heart and cardiac system. Its twisting torso movement greatly aid the digestive system. Its thigh strengthening leads to longevity. All classes incorporate movements from the Xin Yi Liu He Quan tradition as taught to Bob Lau from Master Qian Zhao Hong with additional instruction from George Xu. Xin Yi is an excellent discipline to improve postural alignment, overall fitness, and freedom of movement. It is pronounced “Shin E”. Master Qian was featured on the cover of T’ai Chi magazine in 2004 (Vol. 28. No. 5). Master Qian learned his Xin Yi in Shanghai from a famous martial artist named Lu Songgao. Lu Songgao was the first one to teach the art to the general public. The full name of this martial art is a mouthful: Xin Yi Liu He Quan. The translation is: Mind Intention Six Harmony Fist. It means it is a martial skill that incorporates and integrates both internal and external alignments. Externally Xin Yi may appear to be a hard martial art, but look more closely. Xin Yi gives you more energy than it takes from you. Xin Yi practice doesn’t leave you breathless, doesn’t exhaust you. Training to exhaustion—a very Western approach—is harmful to your health; it is straining and draining. The rhythmic movements of Xin Yi, while sometime quite explosive looking, are embedded with alternating movements of relaxation. It is express, relax; express, relax; express, relax. You get to exercise your body sensibly following the philosophy of Yin and Yang. Xin Yi reinvigorates without exhausting you—a key point missed by most Western style exercising, sportications, and fighting methods; as well as most Eastern martial arts. While being a superb workout, Xin Yi does not tire a body like so many other systems do. The internal methods of spiral, focus, back power, relax, rhythmic movement, etc. actually energize instead of tiring, as many martial arts and much of cardiovascular routines do. A Xin Yi practice wakes you up and heals little ills. It is rare that you don’t feel better after class than before. Xin Yi improves your health, the functioning of your body. Health is more important than fitness, though Xin Yi delivers fitness as well. Fitness means being in exercise shape; you can run or whatever, but internally, it may not be so good. Your organs, or digestive system or nervous system may be wrecks. There are three main branches of Xing Yi, including this one, which is actually spelled Xin Yi, with no “g” . This is 10 Animal/6 Harmony style Xin Yi. As taught to Bob by Master Q, it is less intense and hard than what much of Xing Yi is. The Six Harmonies are underlying principles of alignment that lead to martial skill, physical health, and mental strength. The Six Harmonies are applied to all parts of the art, every movement, every posture. The 6 harmonies consists of the 3 inner harmonies and the 3 outer harmonies. Outer Harmonies: Hand & Foot; Shoulders and Hips; Elbows & Knees. The “Three Outer Harmonies” is a shortcut term describing the postural and movement principles of Xin Yi. In this training you learn how to properly line your joints up, stay in strong positions, use your whole body, move with ease and strength, root and ground, turn from the waist, and properly position your limbs. These harmonies are then tested with a partner to see if you are doing them properly. By testing in weak positions and strong ones, you begin to relearn how to be fully in your body in a relaxed, powerful way. The Outer Harmonies are most important to health. The “Three Inner Harmonies” refers to the mental training of Xin Yi. Strength of character and skill of fighting come from what you do inside, from your focus and intent. There are specific ways to train these inner energies. These too are tested in class to see if they are strong or weak. Like the Outer Harmonies, there are many aspects to the “Three” Inner Harmonies. The Inner Harmonies are most important to fighting prowess. Xin Yi uses specific inspirations from the animal world to learn how to move and fight well. It is fascinating to study the 10 animals because each has it’s unique energies, qualities and ways of moving. While each animal trains different ways of expressing your martial and creative powers, they all have a similarity of underlying principles. Learning all of the animals fosters a full understanding of the Xin Yi methods and strategies, while giving a complete program of joint, muscle, spine and internal organ strengthening. Training the different skills, the many qualities of the Ten Animals, is good for fighting preparation, and great as a whole body conditioning process, one that is fun, endlessly interesting, and built on many centuries of martial knowledge. All the animals—indeed all of Xin Yi—include internal, difficult-to-see, spiral motions. 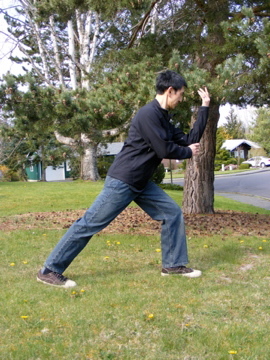 These motions are one of the important keys of both Xin Yi’s powerful fighting methods and many of the health benefits. In addition, each animal has its own personality and strengths. Si Ba: A widespread traditional form done back and forth on a line that includes the most important foundational principles within its movements. 10 Animal Form: A complex and fun long form developed by Qian Zhao Hong that also includes elements of the martial art Tong Bei. Eagle and Bear Contend for Life: An involved form developed by George Xu that runs in the four cardinal directions . Yin Yang Spiral Taiji: Qian Zhao Hong’s combination take on several kinds of Taiji and Xin Yi. 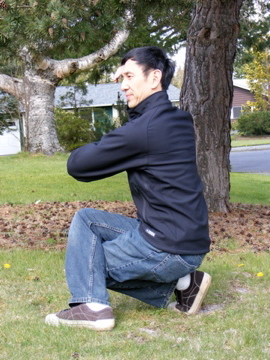 Done in slow motion, it is a superior training tool and Qigong.